This could literally save your life. Life can be stressful for a leader because everyone wants a piece of you. It’s easy to feel like you’re always failing to meet expectations, falling behind, and pulled in multiple directions. Your calendar gets full, challenges get big, and you find yourself stuck in the trenches day after day, not rising high enough to see the big picture. Laughter goes away because the pressures and demands seem so great. If you are a leader in any capacity, you have faced this kind of distress already. Some stress is good. It stimulates you and keeps you interested in what you are doing. If you play guitar, you know those strings have to be tightened to a certain level to be in tune. The same with a piano or a violin. The strings have to be stressed to just the perfect level to make beautiful music. You need stress, but there is a perfect tension of stress. Too little and you are bored. Too much and you are distressed. When you are bored, you are under-stressed, and when you are overstressed, you are distressed. Neither condition is good. Constant stress becomes distress and is harmful to your leadership, your mind, and your body. Prolonged distress can cause hyper-coagulation of the blood, creating heart attacks or strokes. Too much stress can lead to high blood pressure, irritability, depression, and feelings of failure. There are a hundred ways that distress harms us physically and mentally. Distress reminds me of an incident that happened some years ago when an airplane nearly crashed. An island-hopper flight in Hawaii was cruising along when the crew began hearing strange noises. Suddenly the top of the airplane blew away and a flight attendant was sucked from the plane to her death. Everyone wearing a seat belt was okay, and the pilot was able to land the plane despite the big hole in its top. The authorities determined the cause of failure was “metal stress.” When airplanes take off and land they pressurize and depressurize. There is a constant expansion and contraction of the metal that compromises the strength of the metal over time, especially in “puddle-jumper” flights that frequently take off and land. In leadership you find the same kinds of stress acting on your mind and body. It has been said that all of us are in one of three stages: going into a trial, in a trial, or just coming out of a trial. My personal experience has proven this is true! How do you handle stress in leadership? First, it’s helpful to remember that all leaders face stress. At some point almost every leader tries to do too much for too long with too little. Moses tried to manage every detail of leading the Israelites. He became so stressed he actually wanted to die, until God gave him the solution to his distress. If you’re loving Jesus and growing as a leader, you can be sure there will be pressures. King David faced high stress that turned into distress. Listen to his mood in this Psalm. When facing distress you feel trapped in a net. You want to escape, but you can’t. You need some time for yourself but can’t take a vacation. You feel trapped. Once I was facing a number of stressful situations, and I remember saying, “It feels like I have a pegboard with twelve holes and thirty pegs all wanting in. The pegs I don’t have room for are screaming for me to make room, so I take one out and put a different one in, and then the first one starts screaming.” It was an incredibly stressful time for me. David was incredibly stressed and cried out to God. I am sure you have offered up a similar cry at some point in life, “God, bring me out of my distresses!” The apostle Paul faced severe stress and described it this way. Paul’s pressures were so great that he thought he was going to die. Have you faced anything like that before? You can’t always tell by looking at someone if he or she has moved beyond stress into distress. People tend to hide their strong emotions and may seem happy-go-lucky even though they are in turmoil. The same may be true of you. Leaders, by nature, want to keep going and not acknowledge their systems are failing. For that reason it isn’t always obvious, even to yourself, that you have moved into distress. Here are some warning signs of distress to carefully watch for in your life. When you are distressed you think there is only one way of dealing with a challenge. You get frustrated when something blocks that path. Sometimes you just “blow your top.” You don’t mean to, but you’re under a lot of pressure. Sometimes you may even surprise yourself by your lack of self control. Instead of controlling your thoughts and behaviors, your thoughts and behaviors begin to control you. You may sleep too little or too much and not be able to control it. You may find it difficult to push away negative, condemning thoughts. You might think God is upset with you. You might dwell on everything you’ve ever done wrong. You might think repeatedly, “I am a total failure.” Instead of acknowledging a little failure here or there, you magnify every flaw, fault, or failure to an extreme. Every little thing that happens appears to reinforce your negative ideas. It seems like no matter what you do or how well you do it, the reward won’t be worth it anyway. You are caught in a net and feel absolutely helpless to do anything. You call on God, but it seems like he doesn’t answer. Some research is showing that people have only so much stress in a lifetime. Think of a big water container. A little water at the bottom is distress a little more water means a little more distress. If it reaches a certain point, it’s over. 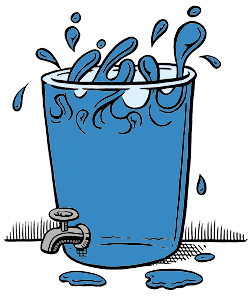 If we have this canister of distress we should put a faucet on the side if it and when we realize we are becoming distressed open the faucet and let some of the water out before it reaches that point. Your body and mind can only take so much stress before failing. Like the airplane that flew too long without proper maintenance of its metal frame and failed, you must find relief from stress, or you will fail. Are you in distress right now? Which of the above signs tell you so? Have you felt trapped or overly frustrated lately? Why? Who knows you well enough to tell you that you seem to be distressed? The above exerpt is taken from chapter 21, “Distress Signals in Leadership” from The Art of Pacesetting Leadership by Dave Williams. for more details and ordering information visit www.davewilliams.com/pl.